Venetian master of landscape painting, the founder of the genre, as the leading, Canaletto wrote his city more often. The more valuable are the occasional appearances in his work of the views of other places and their monuments, including Rome. In this painting, with carefulness that met the requirements of the Enlightenment, the artist captured the Colosseum, an ancient Roman amphitheater built in the 1st century, during the Flavian epoch. The huge dilapidated building occupies most of the work, being in it the main character. This vedta is a typical classic landscape in which the grandeur of ancient architecture is exalted. With his paintings Canaletto causes pride in the act of human hands. Such a rational approach to painting was characteristic of the 18th century, when the mind was placed above all else. Italian art historian Giulio Carlo Argan wrote that on the canvases of this artist the “space seen by the eyes of reason” is imprinted. But in this painting there are so rare in the master features of romanticism, no wonder the work was created at a time when ancient ruins were perceived by many artists as something alive, as seen, for example, in the etchings of the contemporary and countryman Canaletto Giovanni-Battista Piranesi. The view of the history of ancient times as something very close was also in the spirit of a complex era of Enlightenment. In the Coliseum shown here, time left its mysterious imprint, and everything around, even the air, is nourished by this mystery. 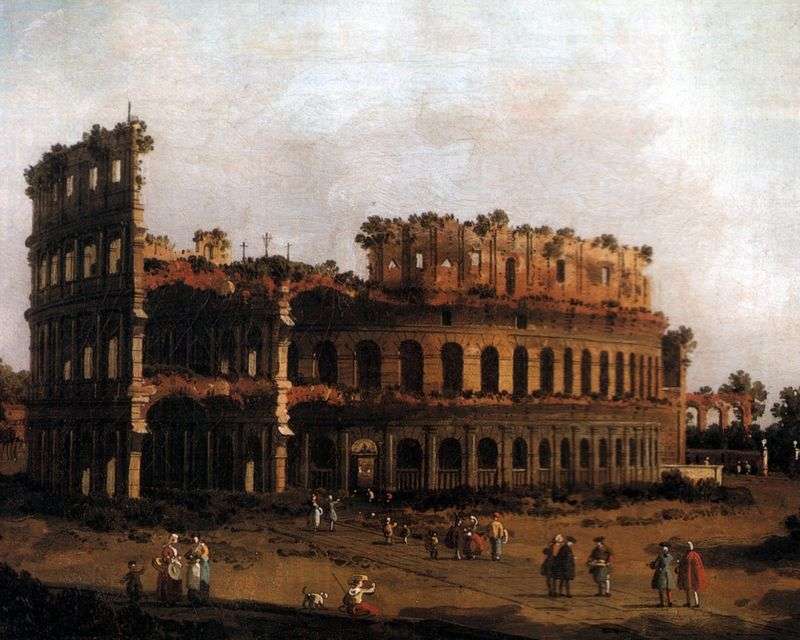 Description and meaning of the painting Colosseum by Antonio Canaletto.